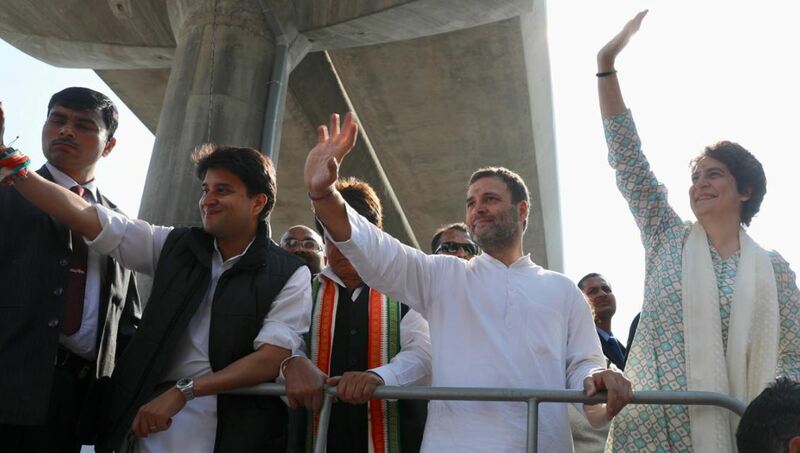 Lucknow: Drum beats, loud cheers and thousands of supporters are what greeted eastern Uttar Pradesh Congress general secretary Priyanka Gandhi, Congress president Rahul Gandhi and Western Uttar Pradesh general secretary Jyotiraditya Scindia here on Monday. Scores of Congress supporters thronged the streets of the state capital to welcome the leaders. Party supporters were seen dancing, sloganeering and cheering ahead of Priyanka's maiden visit to Lucknow after assuming office earlier this month. Despite Priyanka being accompanied by her brother and officials from the party, most of the slogans raised were in praise of Priyanka, with Rahul finding only a few mentions once in a while. Soon after their arrival at Lucknow’s Chaudhary Charan Singh International Airport, the senior leaders embarked on their road show atop a white bus. The leaders were greeted with great zeal by supporters who lined themselves on either sides of the road. In addition to the the brother-sister duo and Scindia, UP Congress chief Raj Babbar, and few other Congress leaders were also present. The route of the roadshow has been decked up in lieu of the occassion, with posters displayed on either sides carrying the party symbol.